A disaster the like of which we hope the world will never see again served to unite charities, countries and even rock’n’roll bands over the last few months. So when Pete Langford asked some of his friends to perform at the Stables in Wavendon near Woburn on the 21 February, in aid of the people that had lost homes and families in the Indian Ocean, everyone was more than happy to oblige. Pete tirelessly arranged the concert and stage-managed the whole event with verve and apparent ease. It was a great success, raising over £20,000 and was attended by many distinguished celebrities, including Jim Marshall (Marshall Amplification), who has always been a staunch supporter of worthy charities. The Barron Knights worked their own bit of magic before taking over the backing of most of the artistes on the show, who included Joe Brown, Bruce Welch, Chas & Dave, Dave Berry, Jess Conrad, Kate Hodges, comedians Joe Goodman and Johnny More, The Tremeloes and me. I’m Brian Poole by the way! This was a great event and an enjoyable night for all concerned. They even say that history was made by the Trems and me by performing together for the first time in 38yrs. We have been on many shows together and although we have not performed on stage together we have always spent some time talking and catching up with all the latest gossip. The last time we did this, was in Esjberg Denmark where we amazed everyone on the show by chatting nearly all night in the hotel bar. Dave Dee and Tony Crane said that it was like listening to the film the Krays! I suppose a bunch of cockneys with a lot to catch up on would give that impression. When Pete Langford told me Rick Westwood was going to join me on ‘Twist & Shout’ and ‘Do You Love Me’ I was really pleased, can you imagine how I felt when Dave Munden said that he was up for it and would even ask Mick Clarke, who although he was and is a founder of the Rubettes was the bass player and singer with the Tremeloes before Chip Hawkes’ time with the band. 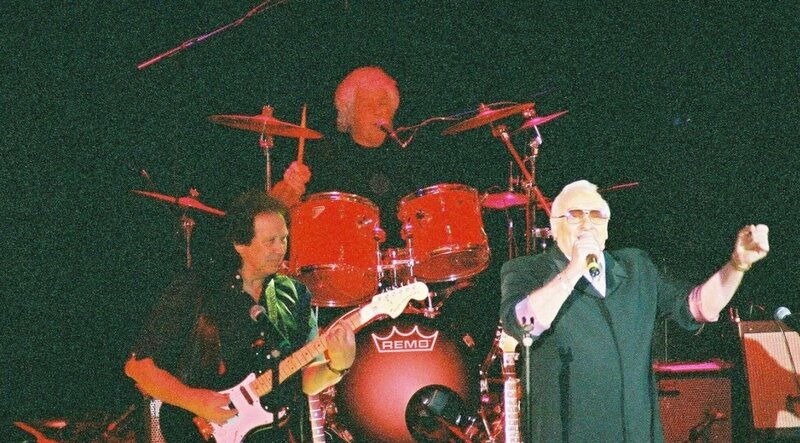 Also joining us was Joe Gillingham, the present keyboard player with the Tremeloes who I have known as a friend and worked with over many years. This was a show that Pete and the Barron Knights can be proud of because although the show was loosely rehearsed it must have looked like everyone was joining in with each other. The Barron Knights, as always featuring Duke D’mond, not only with their own superb act but also backing and linking the whole show brilliantly. Dave Berry with his usual stage craft, even joined on stage by his wife Marthy on his hits including “The Crying Game”. Kate Hodges came onto the stage, sung and played piano in a style that captivated the audience immediately and made all including dad, Chas, very proud. Joe Goodman, king of one liners, kept the crowd laughing with his own brand of visual humour. Comedian Johnny More with an act of pure fun and an abundance of topical gags raised the atmosphere even more. Several appearances by actor Karl Howman ensured that the audience was totally up for it. Finally, Joe Brown, with the excellent trio The Bruvvers, (at one point joined on stage by Dave Peacock on the banjo) playing acoustic guitar and singing he closed the show with the style musicianship and humour which only Joe can serve up. During the first half of the show, Pete Langford went on stage and explained the story of the Tremeloes and me getting back together on stage for this show after 38 years. It was time, we walked on together and it seemed like ages before everyone stopped cheering. Suddenly 2005 had become 1967. “Twist & Shout”, “Do You Love Me” and then it was all over too soon. Thanks Pete for letting us make our little bit of history even more exciting because it was in the presence of one of our best friends and confidantes over many years, the Doctor of Sound and Father of Loud – Jim Marshall. Went to see you on the Solid Silver Sixties show last night (27th April 2014) at Milton Keynes. Really enjoyed it and thought your act was amazing – even got me up dancing! I used to dance to your band every other week at Burtons in Uxbridge – the other week it was Cliff Bennet & The Rebel Rousers. That was probably around 1962/63 so last night was a trip down Memory Lane!